Break Da Bank is the game that started it all, it was the original bank heist that took players into the bank’s vault so they can get to claim their share of the loot that is found in it. The game was so successful that is sparked two games, Break Da Bank Mega Spin and Break Da Bank Again. So get ready to go on one of the most exciting experience of your life, place the bets and start spinning the reels so you can tap into the fortunes that are located in the bank’s safe. 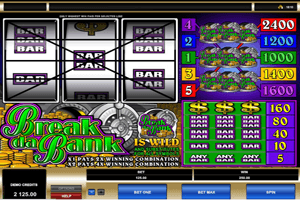 Play Break da Bank Slot here. All of the icons that will land on the game’s three reels and 5 paylines are inspired by the theme of the game, this is why they include the logo of the game, Break Da Bank and a golden dollar sign as well as the regular low paying bar icons. The logo of the game, which comes surrounded with golden coins and stacks of green cash is the highest paying icon of the game as it can pay players up to 2400 coins which they can claim after placing the maximum bet and getting three logos on the payline of the game. It is also a special symbol as it can replace other symbols on the paylines to help players form a better paying combination. It also acts as a 2x and a 4x multiplier when 1 or 2 of these symbols land on the payline respectively.